Is your New Year's resolution to lose weight? Time to start reading! 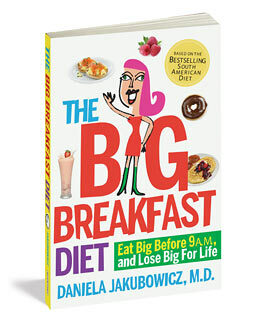 According to Dr. Jakubowicz, dieters really can eat what they want as long as they do it before 9 a.m. Her 28-day meal plan calls for a daily shake or smoothie accompanied by some unexpected breakfast items  like tuna melts, fish tacos and even steaks  that are designed to rev up the metabolism and burn more calories. It also claims to eliminate your craving for sweets, which can help reduce the risk of serious health conditions like Type 2 diabetes. That all sounds great, but the diet's most intriguing benefit may be eliminating that guilty feeling after eating two-day-old pizza for breakfast.